"Hey Mambo! Mambo Italiano!..." I know it's been awhile but I am glad you came! I have been super busy opening up another awesome restaurant with Chef Steve Samson. Rossoblu his Bolognese concept in downtown Los Angeles. For the opening menu at Rossoblu I wanted to play around with some newer aged cocktails that are pretty simple. I wanted to make an ordinary drink unordinary. I often get inspired by a certain flavor in an Amari and this time it just so happened to be the kola flavor in Luxardo's Amaro Abano. It immediately made me think of my "youth" and all the Cuba Libre's I used to drink when I was 21. I thought how cool would it be to make a cocktail taste like it's has kola in it but it doesn't!? 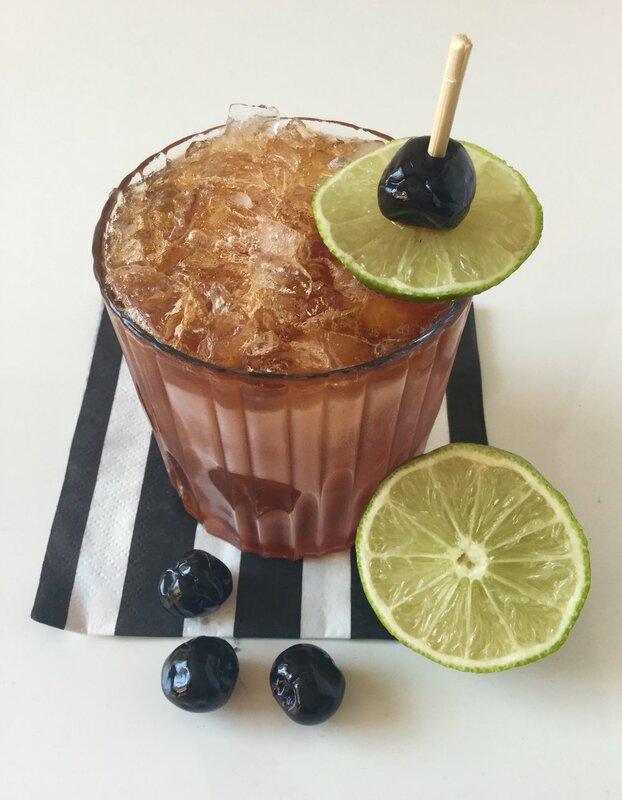 So here you have it my rendition of an Italian Cherry Cuba Libre -No Kola just Amaro! This is a perfect end of the summer sipper that is refreshing and that everyone will love! Imbibe! Hey Mambo! Add all ingredients besides the club soda to your shaker tin. Next add some ice and shake for 2-3 seconds. Then add your club soda and then strain out into chilled glass filled with crushed ice. Garnish with a lime wheel and cherry and ENJOY! Angostura White Oak Rum: Currently the leading standard rum brand in Trinidad and St. Vincent, White Oak remains one of the flagship products of Angostura's impressive rum portfolio. It's Light bodied, slightly sweet with tropical and vanilla notes. Luxardo Cherry Sangue Morlacco: First produced in 1821, a cherry brandy made from the marasca cherry which is known to be more sour and tart. The name Sangue Morlacco means Morlacco blood and was named by the poet, Gabriele D' Annunzio and represents the battle defending the borders of the Dalmatian people with the Republic of Venice in the 17th and 18th centuries. Dark red hue, sweet, sour, tart and delicious! Luxardo Amaro Abano: A medium bitter digestivo made from the maceration of basil, cinnamon, orange peel, kola, condurango and cardamom. Was first produced in 1952 in Veneto.